Cheap flights from Europe to Durban, South Africa from €431! 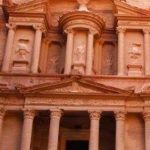 Good news for all budget travelers in Europe that are looking for low-cost solution to amazing Jordan! Ryanair has recently released promotional deals on their new route between European cities and Amman or Aqaba.You can either book very cheap round trip flights to Aqaba from Rome, Athens, Cologne or Sofia. or to Amman from Bucharest, Brussels, Bologna, Vienna. Vilnius, Milan, Budapest, Prague or Krakov. Non-stop return flights are available already for €21 incl. all taxes and fees. As mentioned this is low-cost deal, there is no checked bag nor additional service in base fare. You will find the cheapest flights in most of the cases in second half of November and in December 2018 or January and February 2019. (Except deal from Paphos which is already available thorughout whole year 2018). You can book your accommodation in Jordan through Hotels.com or Booking.com. Famous Dead Sea, incredible Petra or Wadi Rum are main attractions this beautiful country in the Middle East can offer..Below you can refer to our booking samples on each of the routes available..
Booking sample of Low-cost flights from Europe to Jordan from €21 return! In this case you would depart from Athens to Aqaba on 30th of November and return from the Middle East back to Greece on 10th of Decemberr 2018.